The Hong Kong Culture Series - Dance Collection introduces Beijing audiences to Hong Kong's modern dance world, an artistic form often overshadowed by its pop culture. The event opened on July 1 at the Oriental Pioneer Theater of Beijing with a free photographic exhibition and will run through till July 10. The event's presenter, Beijing LDTX Modern Dance Company, has invited four modern dance groups from Hong Kong to perform at the Oriental Pioneer Theater: City Contemporary Dance Company, Unlock Dancing Plaza, why_me_dance and Passover Dance Company. 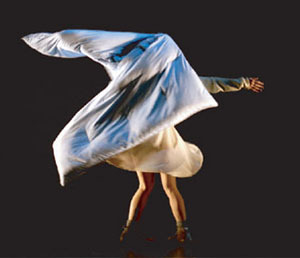 "These troupes' works are of various styles," said Willy Tsao, artistic director of Beijing LDTX Modern Dance Company and City Contemporary Dance Company. "Some may shock you, some may make you laugh, and some will bring you very fine feelings." On July 3 and 4, Hong Kong's first and longest-running professional modern dance group City Contemporary Dance Company presented a performance titled "Silver Rain, " which put together the most memorable works of six outstanding choreographers of the group, including Tsao. The works are inspired by aspects of Chinese culture including philosophy, history, operas and even Chinese rock'n'roll. On July 6, the Unlock Dancing Plaza will perform "Whisper of Love," which is described as "the pursuit of ordinary sensation from the extraordinary world." Unlock Dancing Plaza tries to stress the exchange between audience and performers, and create a new and tailored experience of modern dance viewing for audiences. "You Had Better Dance "
On July 8, the why_me_dance group will present "You Had Better Dance," which was inspired by John Lennon's song "Beautiful Boy." Through her dance, the choreographer of "You Had Better Dance," Yang Huimei, tries to express her internal struggle as a dancer - a mixed feeling of love and hatred of dancing. "You Had Better Dance " includes four parts. The first part, "You," raises the question: who are we? The second part, "Had," asks: what do we need to commemorate? The third part, "Better," leads the audiences to think: is there a better way to do what we are doing? The fourth part "Dance," discusses: what is dance? According to Yang, she didn't give answers to these questions, because the modern dance has a sense of humor and provides the viewers with the space of thinking, imaging and understanding the meaning of dance on their own. On July 10, the Passover Dance Company will perform a work titled "Xin Xiang," through which the choreographers will bring a bit of freshness to the busy city. Inspired by two works of renowned Chinese painter Wu Guanzhong, "Cypress" and "Waterfall", "Xin Xiang" expresses the dancer's view of life through the image of trees : whatever difficulties we are confronted with, we should never give up and seek and seizure the chancing of living. There will be a "meet-the-artist" session after every performance, and the dancers and choreographers from Hong Kong will also have dance workshops during their stay in Beijing. The Hong Kong Culture Series will present a number of events to introduce the culture of Hong Kong. After the modern dance collection, the series will bring the Cantonese Artists Association of Hong Kong to perform a Cantonese opera in Beijing in October. "We hope that this series will change many people's impression that Hong Kong is a commercial city with no culture," said Tsao. "Though it's very easy for mainlanders to travel to Hong Kong now, the Hong Kong Culture Series provides a rare opportunity to get to know Hong Kong's culture systematically." The event is supported by the Beijing Office of the Government of the Hong Kong SAR, Hong Kong Arts Development Council and the Art Development Fund of the Home Affair Bureau of the Government of the Hong Kong SAR.